I initially bought a cheap ~A$90 'GMV2' unit from China, via banggood.com. The unit arrived safely and seems to be working OK. It has four 'modes' - uSv/hr or CPM, with or without a 'beep' every time the GM tube generates a signal (generally from gamma rays, but there is also always some random system 'noise'). 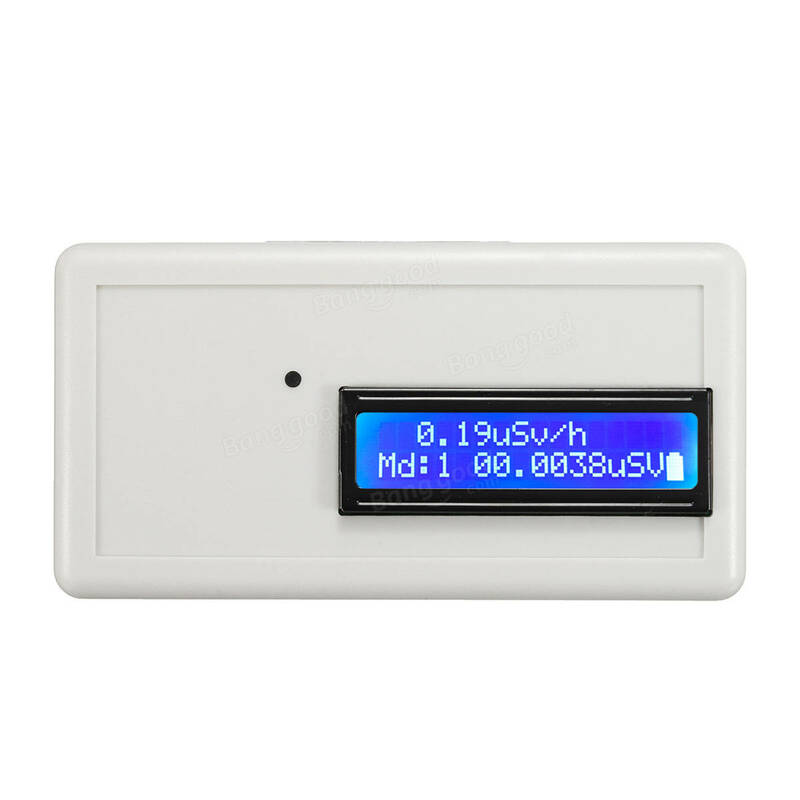 The built-in rechargeable battery lasts about an hour, so for measuring background radiation over longer periods it has to be left plugged into a USB power socket. I've run it for about 15 hours non-stop on several occasions and it worked fine. Unfortunately, it doesn't have an audio or data output port, so for data logging readings ever minute for the 12-15 hours I've had to leave it sitting in front of my laptop webcam and use a free image capture utility to record the display every minute. Manually entering the readings into excel is quite tedious. Background radiation readings in our kitchen are around 0.08 uSv/hr on average, and outside on the patio the reading is around 0.04 uSv/hr (which seems about right, since the official background radiation reading at the ANSTO monitoring station at Engadine normally hovers around 35 nGy/hr = 0.035 uSv/hr). Readings indoors generally tend to be higher than outside, as radon gas decays into particles, which tend to accumulate indoors. Fortunately most of Australia doesn't have a problem with high levels of radon gas, unlike parts of the USA and Europe. To test the meter response, I looked around the house for possible radiation sources, and managed to get about double the normal reading when the Geiger counter was placed on top of a granite slab (a discarded remnant from someone's kitchen renovation) that we use as a step in our garden. I also bought a packet of 'lite salt' at the supermarket, which has around 50% of the NCl replaced with KCl, and potassium naturally has around 0.0117% radioactive isotope K-40. Readings taken with the Geiger counter sitting on top of a zip-lock bag filled with the 'lite salt' were around 0.12-0.15 uSv/hr, so it provides only a slightly elevated reading above background. I've also ordered a couple of potential, low-level radiation sources for DS2 to safely experiment with - a packet of ten TIG welding rods that contain 2% thorium for $10, and some gas lantern mantles that *might* also contain thorium (the ones now sold in Australia no longer contain thorium, so I bought some 'extra bright' ones from China for $2, that, hopefully, are old-school). I'll keep these locked away in the garage, as they need to be handled and stored safely. I took the Geiger counter along on a little field trip to a site (Kellys bush) in Hunters Hill that was used as a radium refinery in the early 1900s, and used to have some mildly radioactive slag scattered around the area (the local council used to make road base!). There had been a very expensive clean up of the area done only a couple of years ago (the more 'radioactive' waste was taken to landfill to alleviate the local resident's concerns), but I was hoping that there might be a few left over samples still to be found. It turned out that the background radiation readings in the area weren't particularly high (~0.20 uSv/hr), which is lower than you find in high altitude locations (less atmospheric shielding from cosmic rays), or in areas with naturally high background radiation. But in one area the background reading was around 0.25 uSv/hr and I collected a couple of samples of black rocks (possibly slag). Down by the waterfront I found a fig tree with several likely-looking black rocks scattered around its roots, and the background reading there was between 0.50-0.70 uSv/hr. I collected the most 'radioactive' sample I could find, and later I checked the reading again (in an area where the background reading was only 0.07 uSv/hr) and found there is a spot on the sample surface where the Geiger counter reading reaches 0.74 uSv/hr. Still not dangerous (the EPA limit for public exposure is around 0.56 uSv/hr above background), and well under the 2.25 uSv/hr level for constant exposure that would be considered a significant risk. I'm still going to keep it locked away in the garage though! For DS2's science experiment he is intending to try and measure the natural 'spike' in background radiation that sometimes occurs when it rains (radon decay products can be 'washed out' by rainfall if it hasn't rained for a week or so. This can elevate the background radiation level by up to 50% or so, which then drops down to normal levels after a couple of hours. The half-life of the radioactive isotopes, Pb-214 and Bi-214, is around half an hour). 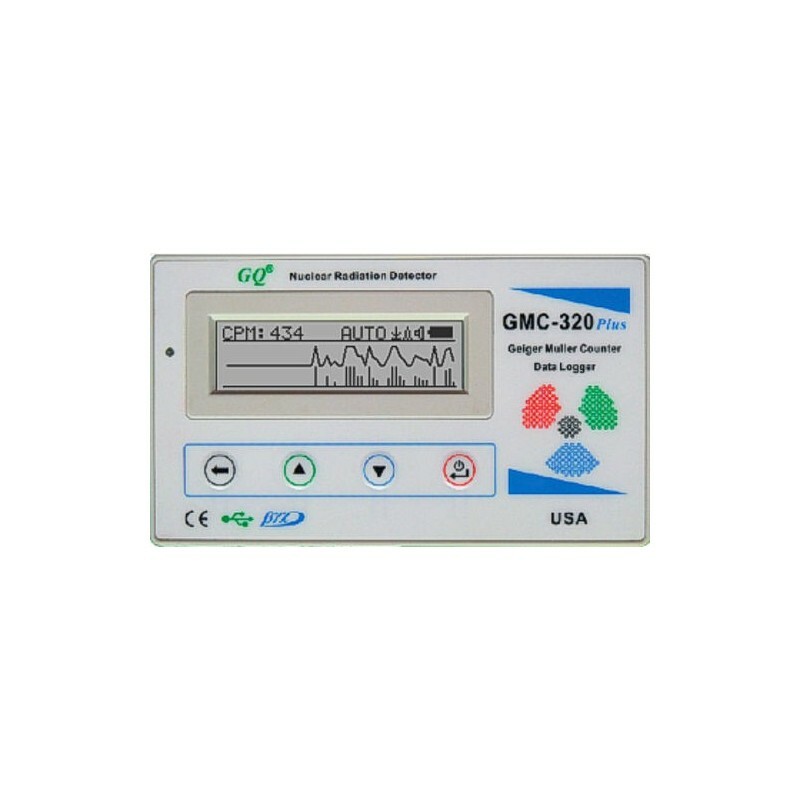 Since the current Geiger counter can't easily be used for data logging, I decided to buy a second, more expensive (A$185) Geiger counter (model GMC-320plus) from Canada (via Ebay). 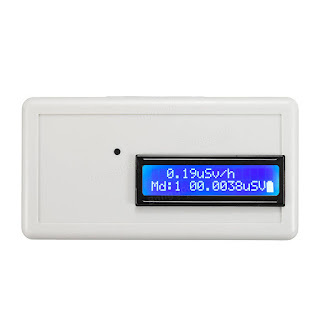 This model isn't any more sensitive or accurate than the GMV2, but it has a longer battery life (~ 6 hours) and provides data output via USB cable, and free software to log the readings. This will make it a lot simpler for DS2 to setup the instrument and leave it running, and he can just check the plot after a heavy rain storm to see if there has been any 'spike' in the background radiation. 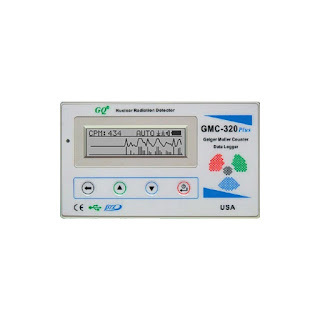 While neither of these instruments is suitable for use as a 'survey meter' in the event of a radiological emergency (they are too sensitive and would soon saturate), they could provide an initial warning of heightened radiation levels and the GMC-320plus can be set to sound an alarm when a predetermined threshold is exceeded. They could be used to monitor levels within a shelter (assuming the shelter had a high enough protection factor).